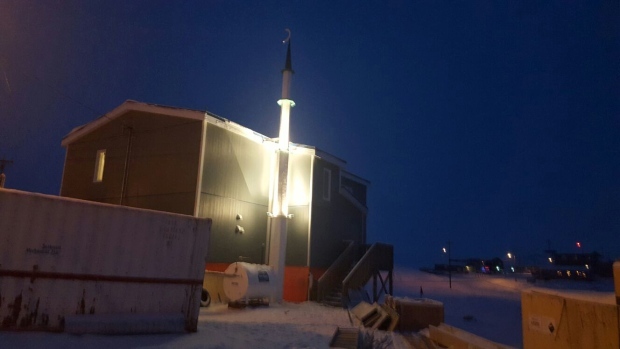 As a construction crew secured the crescent-topped minaret into the snow-covered ground, Iqaluit’s first-ever mosque was officially complete Monday. For the building co-ordinator, it’s a hard-earned victory after an arduous project plagued by limited shipping capabilities, steep construction costs and, of course, the weather. “When I think of all the obstacles and all the headaches we’ve gone through, it’s like, wow, it’s complete. Thank God,” Hussain Guisti, general manager of the Zubaidah Tallab Foundation, a Winnipeg-based charity funding the mosque, told CTVNews.ca. Land was scarce and expensive, so the group had to buy an undesignated plot and convert it into a usable space. That was 2012. By 2013, they had the thumbs-up to start building. But by the time the approval came in, all the Iqaluit-bound barges -- of which there are a limited few -- were done for the season. Chartering a flight was simply too expensive. The construction supplies were eventually transported by barge later on, but more headaches lay ahead. The cost of hooking up plumbing was estimated at $270,000. Ordering a pizza for the construction crew cost $59. “It’s just how things are done in the North. It’s something you have to go through,” Guisti said. The final cost of the two-storey mosque is about $750,000, with most of the money coming from fundraising efforts. Worshippers still have to wait a short while longer. A few doors and baseboards still need to be added to the building’s interior, and an occupancy permit is outstanding. The mosque is expected to open for prayers on Dec. 31. But Guisti insists that, “Islamically speaking,” erecting the minaret means the mosque is done. There are an estimated 80 Muslims living in Iqaluit, and Guisti says he believes the mosque will help draw more “professional families” and new Canadians to the northern capital. “Iqaluit attracts people from all over the country, especially migrants who need to start their life and establish themselves,” Guisti said. Before a Muslim family moves to a new town, Guisti says they will consider whether or not the city has a mosque. Alongside regular services, the mosque will act as a community centre with a built-in food bank and clothing donation centre. The Zubaidah Tallab Foundation previously helped build two mosques in remote communities: the Midnight Sun Mosque in Inuvik, N.W.T. – North America’s northern-most mosque -- and the Thompson Mosque in Thompson, Man. The group plans to start construction on its next mosque in Yellowknife in the summer of 2016.